There are so many questions in life...but few are as universal as: "What is the afterlife like?" For those who have put their hope in Jesus Christ here on earth--Heaven awaits. Addressing questions as basic as What will we do there? and What is it like?, theologian Dr. Paul Enns dives deep into the Scriptures while reflecting on the very personal nature of what is to come. 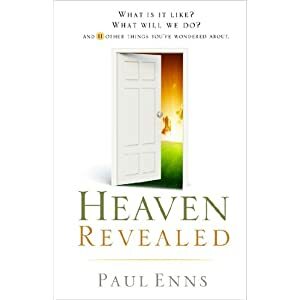 Heaven Revealed is concurrently a helpful, easy-to-read guidebook for Christians as well as an encouragement for those of us who are left here on earth after our loved ones who are Christians pass away. Follow along as Dr. Enns succinctly leads you through what the Bible has to say about heaven. PAUL P. ENNS (B.R.E., Winnipeg Bible College; Th.M., Th.D., Dallas Theological Seminary) ministers at Idlewild Baptist Church in Tampa, Florida and serves as a professor and the director of the Tampa Extension, Southeastern Baptist Theological Seminary. Dr. Enns has also taught at Northwestern College in Minneapolis, and at both Dallas and Talbot Theological Seminaries. He is the author of The Moody Handbook of Theology and Approaching God. Dr. Enns, who was predeceased by his beloved wife, Helen, has two sons. My Take on the BookI have always been a church goer, but not always a strong bible reader. In reading this book, I found that I had a lot to learn when it came to knowing Heaven! This book does a great job at making you think and consider Heaven for what it is and for the mystery that surrounds it. The author had great reasons for wanting to know what Heaven was after his wife passed away. This person need to know Heaven, and God better allowed him to better appreciate and understand the place in which his wife had gone. I liked the fact that the author did a great job at explaining the biblical underpinnings of the story itself and expands on that on how we connect into Heaven both Biblically and spiritually. The references throughout the book to the Bible were easy to follow and I found that I could easily go and read through the passages and gather an even deeper understanding to the passages itself. I would highly recommend this book for anyone that is looking to better understand what Heaven is both spiritually and biblically. This really is a helpful book if you want to understand what the Bible says about heaven, and it's very encouraging if you're coping withe the loss of a loved one. Here's a link to an article that quotes this book.